The students of International Performance Research (MA) write about their experiences during Moving in November festival for Liikekieli.com. This time Armanc Yildiz reviews Jeremy Wade’s Fountain. Jeremy Wade’s Fountain came to Helsinki as a part of the dance/performance festival Moving in November. 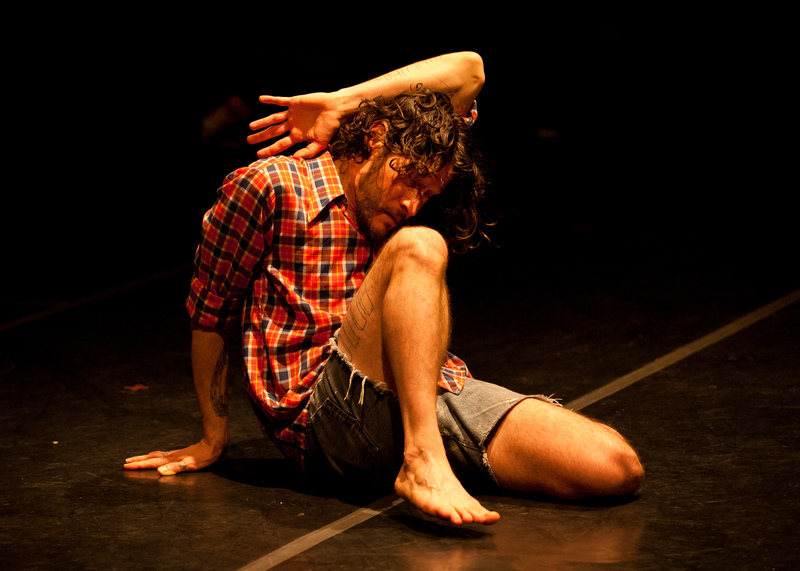 He is a Berlin based artist/choreographer, studied in Amsterdam and quite popular in performance circles in Europe. Considering he has very few solo performances, performing Fountain in Helsinki was a special occasion for Finland’s audiences. On the day of the performance, I went to the venue early hoping to find a seat in the first row, yet just to find out there were no seats. There was no spectacular entrance of the artist into the space, no light effects; he was there to greet the audience who are surprised to see a barely lighted empty space. The performance was made into two parts, as I will call them, Familiarization and Alienation. In the first part, the artist asked the audience to join him doing couple of small but meditating exercises. We were supposed to focus, imagine, feel, touch and breathe deep. By doing so, he created a trust for himself, as well as trust among the audience. It was a very successful attempt to create an ephemeral audience community, which was later revealed to be more than that. On the other hand, he created this aura for himself, almost made a “guru” out of this relationship between him telling us do exercises that did not maybe made sense to us and seemed a bit new age, yet we kept doing it thinking that it will lead somewhere. It sure led somewhere. The passage from the first part to the second part exposed itself through changing these relationships; he separated us from himself going in the middle of the circle created by the audience. At this point, it stopped being a collective experience in a way that the bonds between the audience members were broken and rebuilt between each person and Wade. Our means of experiences were limited back to that of spectatorship. In this sense, him not making a spectacle-entrance at the beginning became an absence that contributed to the making of meaning, as this turn in the performance made a much stronger statement through all these power reconfigurations. After waiting a short while in the middle, he literally started to consume the aura he created, as a primitive ego I have never seen personified. The mixture of his abrupt body movements, animal-like sound and intense facial expressions made him into an alien. “Mine” he shouted, as if he was reclaiming all the attention which was almost solidified through the act of sucking it, staring at one of the participants. Using this fuel of attention he started dancing. Together with the music, this make-believe became hypnotic; it created this feeling of getting in touch with another species, one that we already knew, one that each of us try to suppress, seeking for attention and immensely selfish. The corporeality of this primitive ego unmasked the processes of “humanizing.” Besides the meanings that I dig for, the rest of the performance was more of a trance experience, a beautiful coming together of sound and image. Although the meaning making part of the performance was not as strong, Jeremy Wade’s Fountain was a delightful experience. Studied Cultural Studies in Istanbul and currently studying International Performance Research (MA) in Helsinki University. Supported by: Capital Cultural Fund, The Governing Mayor of Berlin – Senate Chancellery – Cultural Affairs. With the support of Tanzfabrik Berlin and Uferstudios. I like that you see the contrast between first and second part as familiarization via alienation. Nevertheless, I'd rather call the alien inside of us Id, than Ego. Id is the instance that never is in conscious, so for our conscious it is kind of an alien – but still inside of ourselves. Id can be personified as something that shouts "Mine! ", because it is not in contact with reality, it does not take reality into account – it produces (egoistic) desire impulses. And if the Alienation part can be understood as story about Id that does not bother itself with reality (of others), than the Familiarization part gains connotations of repression: we repress our desires to be able to be in contact with reality of others. However, we can also call this part Dive. If we dive inside of ourselves, deeper and deeper – we would find Id.